Another great build from the architecture series rendered with POV-Ray. I was trying to add some back light, but I'm not sure I'm happy with the results. It took 3 days to render and it still has anti-alias artifacts. Overall, it looks pretty good though. 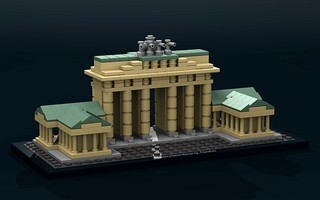 Besides the title brick, I only had to model a few new pieces: the fence pieces and the 4 stud brick on top. The tap on top is actually from the LGEO library since I was too lazy to build it myself.